Coca-Cola’s billboards might have spread the image we have for Santa Clays today but the person usually credited with creating it was Thomas Nast, the cartoonist at the influential Harper’s Weekly magazine in New York in the mid-late 19th Century.. Nast’s father was a Protestant from the traditionally Catholic German state of Bavaria who had fled to New York for political reasons when the boy was six years old. Nast’s drawings embodied both the way that old Catholic traditions of St Nicholas were being rapidly redesigned through Protestant eyes and the way that traditions stemming from fourteenth-century Europe were reborn for the society of nineteenth-century America. 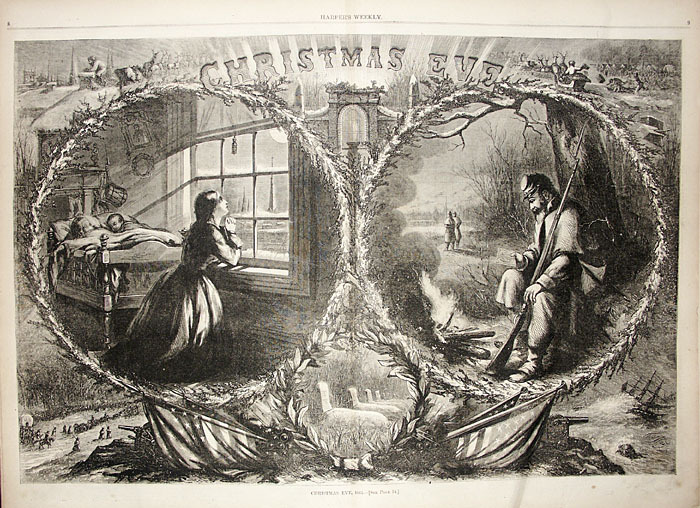 Nast’s first image of the character that came to be embraced as Santa Claus appeared on the front cover of Harper’s Weekly in December 1862. 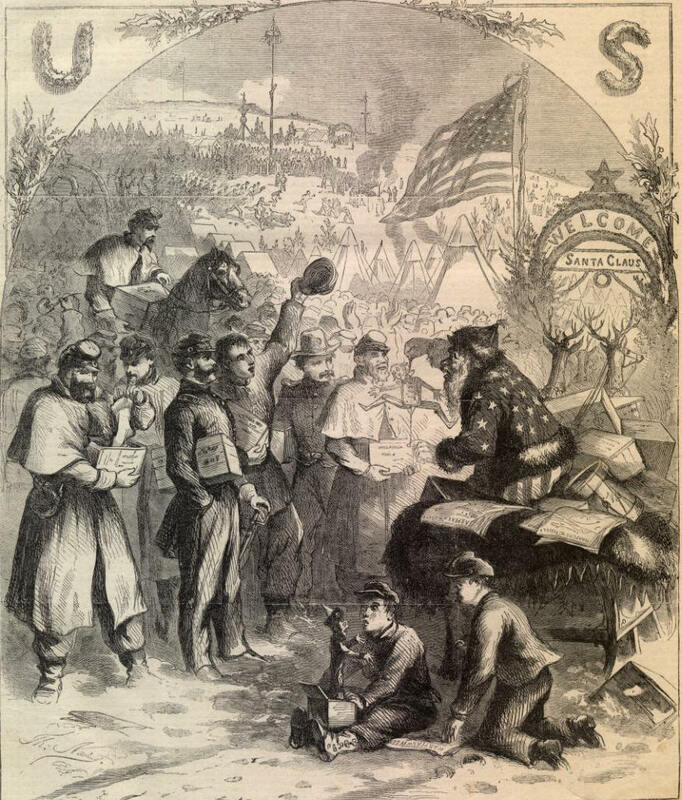 It was the height of the Civil War and a low point for the North, who had suffered heavy losses at the Battle of Fredericksburg only a few weeks before Christmas. Nast was a fervent supporter of the war and the battle against slavery but drew an image to reflect his sadness at the separation and loss that the war caused in everyday families. 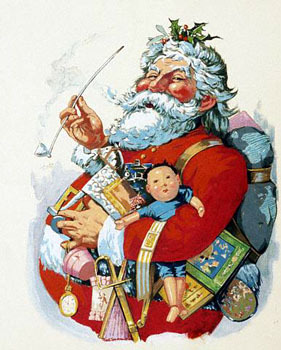 Nast, who had spent time in England, may have been influenced by the way that Father Christmas had developed as an expression of sadness for lost Christmas traditions and hope for a better future. He drew a powerful, striking image of despair as a wife sits praying at her window whilst her children lie in bed. Many miles away sits a weary, ageing solider. He has the beard and rotund gait that was already familiar in the pictures of the Christmas Men and would soon be known around the world as Santa Claus. But, far from the joyful personification of Christmas, he slumps sadly with a letter in his hand. Even 150 years later, it is a moving and heartbreaking image of longing, hope and loss. A year later, Nast drew the same figure again, this time clearly identifying him as Santa Claus. He dresses in a Unionist flag and hands out presents to soldiers who are separated from their families. After that, Nast continued to draw Santa for the next thirty years. Once the war was won he seemed to cheer up considerably and he gradually became the man we know and love today. Nast’s German roots meant that he was aware of European folk mythology and his residence in New York meant that he was also aware of the Clement Clarke Moore poem. Nast’s drawings were the point where European traditions and Irving’s and Moore’s writings came together to create something new. St Nicholas was no longer an austere saint but a jolly toymaker. His assistants were no longer angry fearsome devils but friendly elves. He did not judge children but simply stored their hopes and wishes in a giant ledger. He liked food being left out for him but he was not going to punish anyone who failed to leave him an offering. Nast was also the first person to encourage children to write to Santa and to locate Santa Claus’s workshop at the North Pole. 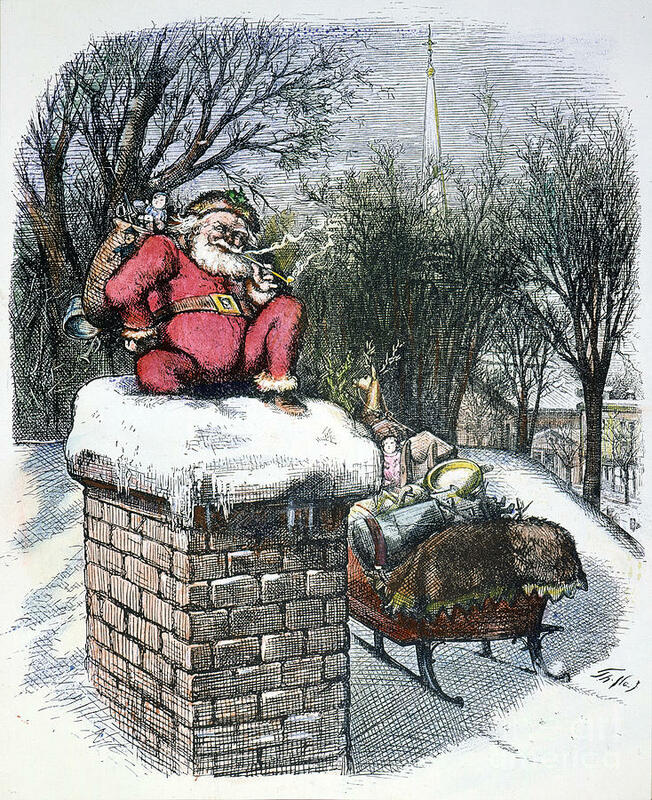 Nast’s grandson Thomas Nast St Hill speculates that the reason for this was the combination of a neutral location, so that Santa could not be appropriated as a political figure by any particular country, and the fact that the North Pole made it easy for Santa Claus to access both the United States and Europe – even at this time Santa’s status as a global gift-bringer was beginning to develop. Nast helped put European folklore back into the heart of Santa Claus, albeit in a much nicer and more child-friendly form than it had ever appeared before. In doing so, he helped ease the way for Santa to supersede the same myths he had been inspired by. It was through his drawings that Santa Claus became generally accepted as wearing red. “Bad Santas and Other Creepy Christmas Characters” by Paul Hawkins is available now from Simon & Schuster. The images above are all by Thomas Nast.